Sufism is generally understood to be the inner, mystical dimension of Islam. A practitioner of this tradition is generally known as ‘Sufi’, though some adherents of the tradition reserve this term only for those practitioners who have attained the goals of the Sufi tradition. In my interview with Grand Shaykh N. Wahid Azal, Founder of the Fāṭimīya Sufi Order which synchronously weds the central currents of High Shi’te Islamicate gnosis, esotericism, Kabbalah, and Shamanism, N. Wahid Azal shares knowledge on many topics ranging from Islamic Occultism, the Zoroastrian sacrament known as Hoama, esoteric Shi’a Islam, the Babi/Bayani Faith, etc. Here you will find a preview and reference to the upcoming video with myself and Shaykh N. Wahid Azal. Born in Iran N. Wahid Azal is a Shīʿi Sūfī Muslim-Bayānī, white occultist, independent scholar, cultural commentator, political critic, activist, and an unabashed supporter of BRICS multipolarism. BAs (UNM, 1994), MA (NELC, UCLA, 1997), LLB (QUT, 2003). N. Wahid Azal is the also the founder and present Grand Shaykh of the Fāṭimīya Sufī Order. What exactly is the Fāṭimīya Sūfī Order, and how does it position itself within Islam? In the Name of God the Compassionate, the Merciful! Praise be to God, the Lord of all the Worlds! And salutations and blessings be upon Muḥammad and His Pure Household! Amīn. The Fāṭimīya Sūfī Order is a Bayānī (i.e. Azalī Bābī), Neo-Illuminationist (ishrāqī) and Pan-Shīʿite Islamic Sūfī Order. We are devoted to Fāṭima Zahrā’ (upon Her be peace, salutations and Light), the daughter of the Prophet Muḥammad (peace be upon Him), who is considered by us to be the quṭb (mystical pole) of our order, i.e. its inner and supreme head. However Fāṭimīya and Fāṭima do not just refer to the historical Fāṭima Zahrā’ (upon Her be the Light of lights) who died a martyrs death in 633 CE. It also refers to the 19th century Iranian mystic, poet, proto-feminist, Bābī leader and Letter of the Living, Fāṭima Umm Salma Zarīn Tāj Baraghānī Qazvīnī (d. 1852), known to posterity as Ṭāhirih Qurra’tul-ʿAyn (the Pure Solace of the Eyes) (upon Her be Splendor). Ṭāhirih Qurra’tul-ʿAyn (upon Her be Laudation) was my ancestor and during Her life and spiritual career as a Bābī leader was deemed by the Bāb Himself (peace be upon Him) to be the ‘return’ of Fāṭima Zahrā’ (upon Her be glory). She also died a martyr’s death. The Fāṭimīya Sūfī Order is thus a similar attempt as that accomplished by the Bektāshī Sūfī Order several centuries ago with Faḍlallāh Astarābādī (aka Nā’imī) (d. 1395) and his Hurūfī (lettrist) movement. Here, however, we claim the legacy of nineteenth century Bābism, that is, the Bayānī gnostic faith (i.e. Azalī Bābī); meaning, the primary genealogical focus of our lineage is with Siyyid ʿAlī Muḥammad Shīrāzī, the Bāb (d. 1850) (upon Him be Resplendence) <see http://luvah.org/pdf/five/journey-with-me-unto-the-divine-throne.pdf > and his legitimate successor Mīrzā Yaḥyā Nūrī Ṣubḥ-i-Azal (d. 1912) (upon Him be Radiance). Like Nā’imī, the Bāb (upon Him be Laudation) is considered by the mainstream of Islamic orthodoxy to be one of the foremost heresiarchs in Islamic history, particularly given the fact that He claimed to have abrogated the exoteric dispensation of Islam and to have been its messianic fulfilment, that is, the Twelfth and Hidden Imām (upon Him be Light from Light to Light upon Light). Yet he was not the first to have done so in Islamic history, and, moreover, most of His doctrines, teachings and writings are all as sublime testimonies to the possibilities inherent within Shīʿi Islamic spirituality, gnosis and esotericism when taken to their ultimate conclusion – its apotheosis, as it were. As such, whatever the issues of heterodoxy, the Bayānī gnostic faith very much occupies all the cultural, ideological, ideational, paradigmatic as well as practical spaces of Iranian Twelver Shīʿi Islam; and so, whatever the literalist dogmatists or heresy-mongers may hold otherwise, we are re-claiming the rich spiritual legacy of the Bāb (upon Him be Radiance) and His gnostic esoteric creed just as the Bektāshīs did with Nā’imī and Hurūfīsm several centuries ago. Very few, at least officially, will these days dispute the orthodoxy – and, if not the orthodoxy, at least the normativity – of the Bektāshīs within the larger context of Shīʿism. This is what we seek to eventually accomplish as well with the Fāṭimīya Sūfī Order for Bābīsm. Given this, we hold ourselves as belonging to the greater constellation of what historian Marshall Hodgson would have termed Persianate Islamicate. In other words, we are Shīʿite Muslims, but Shīʿite Muslims with a twist. We venerate the Fourteen Infallibles – that is, Muḥammad, Fāṭima, ʿAlī and the other eleven Imāms of their progeny (upon them be the Light of lights) – not just as independent historical personalities but also as Cosmic Aeons who symbolically together form the Pleroma of a singular Divine hypostasis; namely, the celestial Hiero-Intelligence or (in Arabic) ʿaql: the Hiero-Intelligence (ʿaql) which is considered to be the first emanation or divine outflowing of the essence of the transcendent godhead in pre-eternity and also known as the Primal Will, the Universal Intellect, the Muḥammadan Reality, the conjoined pair Logos-Sophia, Adam Qadmon, Anthropos Telios, or simply the Eternal Imām. I sometimes also describe us with the neologism post-Islamic. Yet, just as with the relation of modernity to postmodernity, post-Islamic does not necessarily mean ‘beyond Islam’ or that we are in any way rejecting the integrality of the Islamic Tradition. Heaven forbid! Quite the contrary. We are very much an intrinsic part of the greater Islamic Tradition and are very much Shīʿi and Muslim. A study and investigation of the writings of the 20th century French Iranologist and Islamologist Henry Corbin (d. 1978) – whom we all consider to be a spiritual Master in his own right, and whose deep philosophical insights into the universe of esoteric spirituality guides us as well – will offer a better gauge regarding this typological neologism ‘post-Islamic’ and what it entails. Some brief comments by me in a recently published journal article on the central Bayānī figure Ṣubḥ-i-Azal (d. 1912) (upon Him be Magnification) <http://luvah.org/pdf/four/invoking-the-seven-worlds.pdf> will also shed light on the meaning of post-Islamic. All that said, let me reiterate and underscore the point one more time, when all is said and done, we are Shīʿi Muslims. We hold this Tradition to be sacred and venerate its central figures as our own. The struggles and aspirations of Shīʿi Muslims everywhere are our own struggles and aspirations. What is dear and sacred to them, is dear and sacred to us as well. We are their immediate spiritual family and they are ours. We simply reject the Uṣūlī ecclesiastical establishment and its interpretations – as did many Shīʿite gnostics, esotericists and theosophers before us, such as Mullā Ṣadrā, Muḥsin Fayḍ Kāshānī or Shaykh Aḥmad al-Aḥsā’ī (who is a Master of our lineage) – and view certain matters differently. Otherwise we are just like them and hold them dear as our fellow brethren in faith. You have quite an impressive background as a scholar, and your position within the Fāṭimīya Sūfī Order is also well respected of course but as you are also vocal politically…are you able to reveal if this has been a progressive involvement for the Order? In some texts of Shiʿite theology and metaphysics, Justice (ʿadl) is deemed to be one of the highest attributes of God. In fact it is one of six of the highest attributes descriptive of the Divine Essence (dhāt) Itself whereby one cannot even talk about Divinity without simultaneously also talking about Justice. In other words, Justice and God’s essence are coeval, as it were, so to talk about God and Divinity is to talk about Justice, and vice versa. That stated, my politics and the politics of almost everyone directly associated with me is non-Marxian Left-wing and Anarchist, because one cannot truly be spiritual without possessing a social conscience as well, especially because godliness and justice must go hand in hand. We also have the example of Imām Ḥusayn (upon Him be peace) here to go on as well who famously said, “do not oppress anyone nor allow any tyrant to oppress!”; not to mention those verses of the Qur’ān which unequivocally condemn the tyrants and corrupters of the earth; thus making resistance to social injustices and those powerful, corrupt entrenched elites who perpetuate them a sacred obligation and duty. I have been for some years also developing a political theory for esoterically inclined people with a leftwing-Anarchist bent, which I have dubbed Theophanocracy. My ideas around Theophanocracy are still evolving and being fine-tuned over time; but social activism and the greater fight for social justice and liberation everywhere is a central, sacred aspect of what a theophanocratic praxis (a ‘Liberation Theosophy’) looks like. In short, a Theophanocratic theory asserts that no power or authority is legitimate other than the power and authority of the Spirit Itself; and since the Universe/Multiverse is the plane for the endless Self-Disclosures or theophanies of the Divine, therefore all those who have truly realized this fact in its full dimensions and spectrum – i.e. those who have become pure, unsullied and undisputed channels for the divine theophanies – are the only legitimate loci for the exercise of political authority in the world. A Theophanocracy is thus a rule or order by Theophanies. This may surprise some, but to me, engaging with the struggles of Indigenous and First Nations peoples is an important facet to any Theophanocratic praxis. My own brief involvement with the Native American Navajo Nation of New Mexico during the early 1990s first impressed upon me the importance of this. In Australia at the moment the Fāṭimīya there, to my great joy, has become quite actively involved with the Australian Aboriginal Sovereignty Movement – and we all stand shoulder to shoulder with that movement, its aims, aspirations and goals, and all who are committed to it. As such, indeed, we are also committed environmentalists; but to us the cause of First Nations/Indigenous peoples – and that of Traditional cultures elsewhere – goes hand in hand with an authentic environmentalism because it is these cultures and peoples who have historically been attuned in a real, genuine way to the Spirit of Nature: the Spirit of Nature which the globalist/capitalist and colonialist Beast has been bent on destroying! Given this, we are obviously quite committed anti-globalists and believe Western capitalism in its present multinational, corporatocratic form to be the greatest evil plaguing the entirety of our planet from one end to the other including all species upon it, be they human or non-human. On the practical geopolitical front, although as yet far from being a perfect model, we also stand with the ideals of multipolarism and the BRICS bloc of nations (presently composed of Brazil, Russia, India, China and South Africa), which means we are steadfastly against the unipolar and so-called ‘New World Order’ pretensions of the Anglo-American Empire and its allies and those elites behind them. This does not mean that BRICS is some utopia counter-force above criticism. It means at this time it is the only force capable of putting in check the unchecked power of the unipolar Anglo-American New World Order and, praise be to God, to stop it dead in its tracks. Our anti-capitalism also stems especially from the teachings of the Bayān. For example, in the eleventh gate (or section) of the ninth unity (or chapter) of the Persian Bayān (a work which the Bāb initially began and left unfinished for Ṣubḥ-i-Azal as His successor, upon Them be Scintillance, to continue up to the end of the eleventh unity/chapter), selling, trade and commerce in any of the four elements (i.e. air, fire, water and earth) is strictly prohibited and also deemed a sin because these four elements are sacred; and, furthermore, on the material plane, these four elements in their principles constitute the fundamental building blocks of creation and are placed by Providence for the sole use of all creation and so must, by necessity, be free for legitimate utilisation and survival of all species while simultaneously respected and protected from greed, hoarding, avarice and profiteering. These principles, by the way, are also Indigenous/First World perspectives, not to mention ones that Traditional civilizations held to. The basis of the contemporary system of capitalism, however, especially the energy industry which is at the very top of the hierarchy of the capitalist industrial chain, exists, revolves and thrives precisely upon the commodification, sale and commerce of these four elements of air, fire, water and earth. Given this, from our perspective, the entire edifice and inverted, malefic guiding spirit of Western capitalism and its industries is at core, from top to bottom, a supreme sacrilege against God and all creation alike. Looked at this way, this is not even a specifically religious or political struggle. The struggle against capitalism is an ontological struggle. As Sufis and Shīʿi Muslims, we are also outspoken critics of Islamism and the radical Sunni Islamist movements and ideologies of Wahhabīsm/Salafīsm currently ravaging the Muslim world; not to mention we are anti-Zionists and stand with the Palestinian people and their struggle for self-determination and national sovereignty from the illegal occupation of their homeland by the illegitimate colonialist and racist European settler apartheid regime which currently occupies it. The Fāṭimīya Sūfī Order uses certain herbs within it’s rituals, particularly, Haoma within sacrament, can you elaborate on the benefit otherwise, receiving gnosis through either meditation or possession? O Thou, my Lord and Prince, most Holy Angel, my most precious and beloved spiritual being! Thou art my father and my mother, the Sun and the Moon, who gave birth to me in the world of the Pure Spirit, and Thou art my child and sibling in the sublimity of my thought! With divine permission Thou art entirely dedicated to the government of my person! Thou art the one whose fervour intercedes for me before the Godhead, the God of all Gods, to make up for my deficiencies! O Thou who art clothed in the utmost radiance of the divine Lights! O Thou who resides at the summit of the degrees of perfection, I implore Thee, through the One who has overwhelmed Thee with such sublime nobility, who hast bestowed upon Thee such an immense effusion of grace! O precious One, may Thou manifest Thyself to me at the hour of the Supreme Epiphany! May Thou showest me Thy resplendent Face! May Thou be my mediator before the God of Gods in the effusion of the Siniatic Light of mystical Secrets! May Thou lift the veils of darkness from my heart! This I pray in the name of the One who hath claim over Thee and ranks over Thee! I call upon Thee, O Powers and sublime spiritual Angels, O Ye who art the wisdom of the sages, the sagacity of the seers and the knowledge of the wise! Hearken unto me and appear before me and bring me near to Thy magisterium! Guide me with Thy wisdom and protect me with Thy powers! Make me understand what I do not understand, realize what I do not realize and see what I do not see! Turn me away from the dangers that lurk in the ignorance, the forgetfulness and the hardness of my heart, in order to have me attain to the ranks of the ancient sages and inspired prophets, in whose hearts wisdom, insight, vigilance, discernment and comprehension made their permanent indwelling! May Thou also live forever in the innermost recesses of my heart, and never ever separate Thyself from me! Amen. In the Name of God the Most Praised, the Most Glorified, the Most Holy in the Highest Altitude of the Sanctification of the Glorification of the Holiness of Elevated Sublimity and Transcendence! Say, O Thou Who art the Light of all lights Effusing the Illumination of the Radiance of Thy Being by the blinding Godly Scintillance of the dazzling Divine Brilliance from the Fire of the Morning-Dawn Arisen! O my God, verily I testify at the Throne of the Resplendent Sun of Thy Pre-Eternal Oneness which hath ignited the Manifestations of those flames of holiness glaring the flares of the mirrored rays of the Revelation of the Unity of Thy Glory SelfDisclosing the Theophanic transfigurations of the manifestation of Thy Solitary, Most Singular and Unchanging Face which hath already always annihilated all-things! And O Thou Who art That inhabitant Sovereign of the horizons of my self unveiling the Singularity of Thy perspicuous Reality within the Selves of my horizon! Thou art indeed the Most Manifest and the Most Hidden as the Absolute Manifestation of the Ultimately Hidden! I verily, O my God, testify that Thou art That Who hath left Thy traces imprinted upon the Talismanic-Temples of Thy Unicity by the vestigial signs of the unificating ecstatic attractions of Thy Unicitarianism from a firstness before all firstness unto a lastness after all lastness! O my God, I verily testify at the vision effacing nullificative annihilation of the secret by the victorious rending of the veils off the secreted mysteries of Thy Secret through the apophatic negation of all speculation and the realization of That Realized Reality that is Thee Alone, the Truly Real; for I verily, O my God, testify by the disclosures of the regalitude of Thy Majesties of Glorification without indication from the locus of Thy Post-Eternity to the situs of Thy Everlastingness within the axis of Thy Durationless Perpetuity by the unveilings of Thy Endlessness from a beginning of no beginning unto an end of no end, for Thou art the Godhead and there is no other god but Thee Alone within Thee Alone by Thee Alone from Thee Alone and to Thee Alone, Truly, Truly! We also perform the ṣalāt daily (i.e. the five times obligatory, ritual prayer performed by all Muslims), but augmented to include further prayers by the Bāb as well, and like all Shīʿites we prostrate our heads during the sujūd upon a ṭurbah, namely, a clay tablet made from the dust of Karbalā in ʿIrāq where Imām Ḥusayn (upon Him be peace) was martyred in 680 CE and is now buried. For the Fāṭimīya Sūfī Order a ṭurbah may also come from the dust of the shrine of Shaykh Ṭabarsī in Māzandarān, Iran, which was the scene of the martyrdom of Bābī saints and especially the First Letter of the Living, Mullā Ḥusayn Bushrū’ī Bāb’ul-bāb, who died there between 1848 and 1849. Three sticks in a row after a seal; above them the semblance of a straightened lance Then a blind ‘mīm’ without a tail, then a ladder unto all that is hoped for, but which is not a ladder Four things like fingers in a row pointing to good deeds, but without a wrist. And a ‘hā’ that has been split, then an inverted `wāw’ like the syphon of a phlebotomist, but not a blood-letting cup This is the name whose worth is magnified; if you were ignorant of it before, know it now. O bearer of the Great Name, take sufficiency in it – you shall be preserved from misfortunes and shall be kept safe. It is the secret name of the God, may Its glory be glorified, unto all men, be they Arab or non-Arab! Kumayl: O Commander of the Faithful, what is Ultimate (or absolute) Reality? ʿAlī: What have you and Ultimate Reality to do with each other? Kumayl: Is it not the case that I am already sharing your secrets as a companion? ʿAlī: Yes, indeed. But that which sprinkles unto you is billowing through me unto you. Kumayl: So what is Ultimate Reality? ʿAlī: The disclosure of the Majesties of Glorification without indication! ʿAlī: The negation of all speculation and the realization of that which can be realized! Kumayl: Please tell me more. ʿAlī: The nullificative annihilation of the secret by the victorious rending of the veil off the mystery of the secret! ʿAlī: The attraction of the Divine Oneness by the attributive apprehension of the Divine Unicity! ʿAlī: A Light Illuminating from the Dawn of Pre-Eternity and shedding its traces upon the tablets of the Talismanic-Temples of Unicity! ʿAlī: Extinguish the lamp for the Dawn hath indeed Arisen! Gnosis and spiritual illumination can be attained in countless, innumerable ways. There is a famous saying by the Prophet Muḥammad (peace be upon Him) that says “the paths to God are as numerous as the number of people.” Some paths and methods, of course, are more efficacious than others. Discipline, steadfastness, hard inner work, unbreakable commitment, an attitude of internal chivalry or heroism, and, above all, the fire of an unquenchable desire for union with the divine are obviously very important keys. In the Fāṭimīya Sūfī Order, on top of our other practices, we utilize Haoma and a few other psychoactive plants, such as psilocybin mushrooms and cannabis, as sacraments. The Haoma is the Indo-Iranian name for the sacrament sacred to the ancient Mazdaean people (i.e. Zoroastrians). Although in dispute among some scholars, in their Haoma and Harmala (1989) ethnobotanists Flattery and Schwartz first identified in Western academic literature the identity of the Haoma as being in fact the pegamum harmala, i.e. the Syrian Rue, which in Iran is known as Esfand (also spelled esphand). The following entry in the Encyclopedia Iranica gives one of the best summary descriptions in the academic literature of the historical importance of this plant in Iranian religion as well as in folklore and pre-modern traditional Iranian medicine: http://www.iranicaonline.org/articles/esfand. Be that as it may, the identity of the Haoma as Esfand (i.e. pegamum harmala/Syrian Rue) has been widely known for a lot longer among circles of Iranian mystics and esotericists (especially spagyrists, alchemists and herbalists) long before Flattery and Schwartz ever identified it in academic print. The Esfand is also the most sacred herb of the Zoroastrian religion and is continually burned in their fire temples. It is also burned in most mosques and shrines throughout Iran, not to mention bāzārs and homes. In short, this herb is everywhere in Iran. My appropriation of Haoma for the Fāṭimīya Sūfī Order began with my initial work with the Amazonian Ayahuasca for a number of years during the last decade. The Fāṭimīya Sūfī Order itself formally came into being in mid 2005 during an Ayahuasca vision where Fāṭima Zahrā’ (upon Her be peace) appeared to me in a vision and made me recite a shahada formula 13 times within the session: lā ilāha illā allāh fāṭima wajh allāh/there is no god but God and Fāṭima is the Face of God. I was also explicitly instructed in this vision to add this received formula to the existing Shīʿite one that testies to the unity of God, the apostleship of Muḥammad and the vicegerency of ʿAlī (upon Them all be peace, salutations and the Light of Divine Splendor). Then in early 2008 the same Figure appeared once again in another Ayahuasca vision and told me this time that it was time for me to stop working with the Ayahuasca, and the Amazonian Banisteriopsis Caapi Vine that constitutes it, altogether and begin working instead with the plant of my own ancestors which is the Esfand. At this point, the sacrament sacred to our Order came into being and we have been working with it ever since. The Haoma, in a properly supervised and properly prepared and purified sacred environment, is capable of imbuing deep noetic visions and unveilings of the Mysteries of Being as well as deep spiritual and physical healing when consistently engaged with. The Haoma is a divine sacrament with an ancient pedigree among my ancient Iranian ancestors – a Teacher in its own right – and we treat it as such. It is also a sacrament that needs to be respected and should only be approached by a genuine initiate (the Tradition or initiatic form does not matter, so long as it is an authentic one) and with a correct attitude. To us, the Spirit behind the Haoma is the Simorgh (Celestial Gryphon) who is to us one of the many theophanic/angelophanic forms of Fāṭima Zahrā’ Herself (upon Her be Light), the Divine Mother. The Fāṭimīya Sūfī Order obviously works within mystic depths of the occult such as Hayakil (pentegrammic talismans) and with the Tree of Reality. Have you adopted from other traditions or has it been the other way around? The Tree of Reality – the symbolic kabbalistic representation of the sacred universe consisting of 13 Spheres and 36 Pathways – was the final result of a Working undertaken by me in 2005, the very same year the Fāṭimīya Sūfī Order was born. It came about as a result of some frustrating metaphysical questions that perplexed me for some time regarding both the traditional Sephirotic Tree of Life of 10 Spheres and 22 Paths together with the model of a 13 Sphere and 30 Path Tree offered by the Andalusian Sūfī master Muḥyyidīn Ibn ʿArabī (d. 1240) in two of his major treatises, which at the time I found to be deeply flawed. The Tree of Reality was both my guided synthesis of the two models as well as my personal leap beyond both. This kabbalistic model of the sacred universe is now part of the formal metaphysical and cosmological teachings of the Fāṭimīya Sūfī Order. I first self-published a book around the Tree of Reality in early 2006 entitled Liber Decatriarchia Mystica. But this book is now out-of-print, although floating around in PDFs online, and I don’t have any current plans to re-publish it in its old version again. I will say, however, that there is an angelology associated with the Tree of Reality and that I have also sketched from it the very basic outlines of a Tarot system of divination consisting of 101 cards in total. For now, however, I may leave any further development of this system to my future successors in the Fāṭimīya Sūfī Order. There is plenty there for them to work with and assuredly, God willing, the Spirit will guide them and reveal deeper knowledge about it far beyond anything I know about it. Surah of Power (97) of the Qur’ān within each of whose inner six houses are written the names of the Archangels of Proximity (malā’ikat’ul-muqarribūn) : Mikā’īl, Isrā’fīl, ʿIzrā’īl, Jibrā’il, ʿAnyā’īl and Ruqīyā’īl. sorcery and magic. 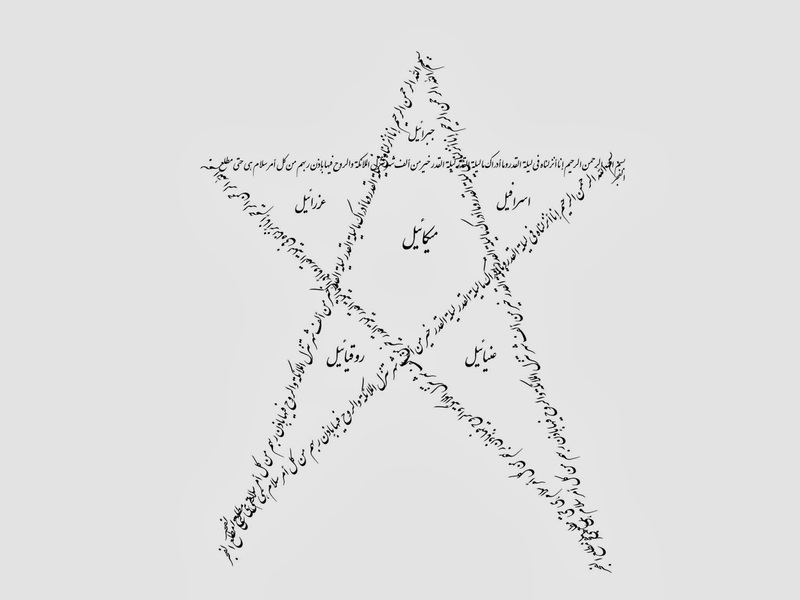 The form and symbol of the pentagram was especially sacred to the Bāb (the Light be upon Him) who wrote many prayers, and even some doctrinal works and correspondences, using the form, as did Ṣubḥ-i-Azal (the Radiance be upon Him). I have used the pentagrammic talismans of the Bāb (the Splendor be upon Him) for my own theurgical purposes for years now long before the Fāṭimīya Sūfī Order even came about; but also, especially, for our Fāṭimīya sessions with the Haoma. Only recently have I begun formulating new hayākil using various Quranic verses, prayers and the magical cipher letters of the Islamic magical tradition known as the aqlām. As a symbol, cryptogram or calligram, in our Tradition the pentagram represents the word Hū (he or It, as I like to designate). Hū or Hūwa, although the proper Arabic masculine pronoun, as a word in this Tradition symbolically represents the totality of the godhead (all the divine names and attributes together combined) and in both modalities of manifestation/appearance (ẓāhir) and interiority/hiddenness (bāṭin). It is both the symbolization of the Ipseity, or the Divine Essence, as well as the Primal Will/Eternal Imām/Hiero-Intelligence who reflects It in eternity. The letters that constitute the word Hū, the Arabic letters hā’ (=5) and wāw (=6), reflect the outer and inner perspectives of the pentagram/pentalpha. These two letters – as well as the pentagram itself – are likewise found within the calligram or symbol of the Greatest Name/Dignity of the Sun which is our most sacred symbol. This is why sometimes in the texts of our Tradition the pentagram itself as well as Hū are referred to as the Greatest Name. You will also find the form of the pentagram within the 13 Sphere, 36 Pathway Tree of Reality. Given all the goals that the Fāṭimīya Sūfī Order has set out to originally achieve how far has the order actually come and how much farther would you like to go? I sort of answered this question above already. But I will also say this, our future is solely and completely in the hands of our Divine Mother Fāṭima Zahrā’ (peace, salutations and the Light of lights be upon Her). She is in control here, this is Her Order, and we are merely Her servants and spatiotemporal mouthpieces. What She determines for the future of the Fāṭimīya Sūfī Order is what will be, inshā’Llāh (God willing)!